Puppets War keeps your little mans protected with their new Temistokles Shields (well, in a game anyway where you can carry a shield. It won't, like, keep your models from breaking or anything). 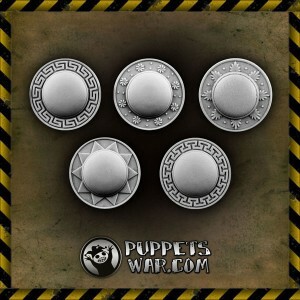 Set contains 5 different Temistokles Shields , designed to fit 28mm tabletop wargames scale, supplied unassembed and unpainted. Designed by Puppetswar Art Team. Sculpted by Maciej Powarunas.